It has been a long time since I last reviewed a Garmin SatNav so I was quite excited to look with fresh eyes at the Garmin nuLink! 2390. This is the top of the range Garmin PND which features live traffic, along with other live services. The headline features of the nuLink! 2390 apart from the navigation are: 3D Traffic, Speed Cameras, PhotoLive Traffic Cameras, photoReal Junction views, voice controlled user interface, and bluetooth hands free operation. In addition to these features there are a whole host of other frills to keep you on the road and informed during your journey. 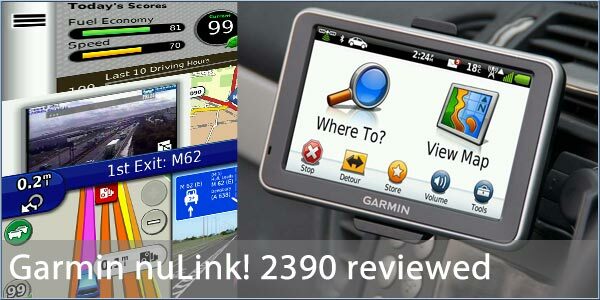 The video above shows a route demonstration of the Garmin nuLink! 2390 highlighting the selection of a favourite, route calculation, driving the route, and the voice instructions. The video shows the Garmin nuLink! 2390 in action. This time we show the voice command, a hands free way to control the SatNav, some different types of speed cameras, re-routing and a mapping error. How does the traffic compare to other systems? What is the source of the information? I too would love to know how it compared against HD traffic as someone who personally speaking is now looking at the alternatives to TomTom. The live traffic is I believe supplied by Navteq. I find it amusing that something that is common for years on every TomTom, IQ routes, is explained here with many words like it is some mindboggling feature. Predictive traffic data is the LEAST you should expect from a PND. Not everybody will be as well acquainted with TomTom software as you obviously are, and a straightforward explanation is perfectly in order. Garmin use Navteq traffic in their products. Before I read your comment, I already wanted to edit my posting. You're right. I too think the review is a good and informative posting especially for people who are not that acquianted with traffic data. What I meant to say though, is I do believe that historic/predictive data is a feature that should already be part of the 'basics', with live traffic being the 'extra', for those willing to pay for it. It's a good thing Garmin is now offering those services as well, to get customers more acquainted with live traffic and subscription revenue models. Because it could serve the gps industry as a whole. Don't forget that Garmin don't own the map data, that is Navteq's. If Navteq haven't offered this data to their customers in the past, Garmin can't include it in their products. I agree that historical journey data should be a basic service now, but it's not entirely Garmin's fault that they haven't in the past. I know it's not their fault. They could've sourced it from TomTom (TeleAtlas) though. Just like some other non-TomTom brands do. But then they should have also abandoned Navteq for the maps. Which was probably a bridge too far. I will be following this thread to see any comparisons between TomTom's traffic data and the traffic data Garmin is now sourcing from Navteq. Do you have any thoughts/experience on that? for me the basic requirement is an aux out jackplug to connect to the car stereo,without this its impossable to hear commands in open top sports cars such as my tvr.i also want to use on my bike.i find it very short sighted of these companies not to supply the jack plugs,it must only cost pence to manufacture. Pence yes, but with ever increasing pressure on costs, those pennies quickly add up. And for a feature that will be sued by only a small percentage of the potential customer base, it's quite understandably seen as a cost that can be cut. You may actually be surprised how much jack sockets cost. I recently built an electronics project with 20 components where the jack socket cost more than the rest put together. The socket was $5.00. Admittedly a company like Garmin would benefit from bulk purchase, but even so adding $1 plus the cost of fitting and testing may reach a tipping point in pricing for some people the vast majority of whom would never use that feature. Adding a BT A2DP protocol would make a lot more sense commercially as the hardware is already present.